I had shrimp skewers in the fridge ready for dinner until I read Annie's blog. Then I decided to change my dinner plans. Her salad looked so good that I had to make my own version for dinner. Sooo glad I did- this was amazingly delicious. Oh and I am not using measurements because you can really add as much or little of everything as you want. So use your best judgement. * Dice onion small. Place in microwave safe bowl and cover with paper towel. Cook for two minutes or until translucent. This takes the bite out of the onion without over cooking. * Dice tomatoes and avocados. I like them big and chunky. * Add the onions, tomatoes and avocados to a bowl. Add juice of 1-2 limes, depending on how much you are making. Toss evenly. Add salt and pepper to taste. * Saute or grill peeled and de-tailed shrimp. I first tossed mine in a little lime juice, salt and pepper. Then sauteed them in a tiny bit of EVOO. Cook just until they turn pink- 2-3 mins max. * Add shrimp to avocado veggie bowl. Toss. You might want to add the juice of another lime depending on how much juice you want in the end. Pop in the fridge for 20 mins to chill and let flavors blend. * Add big bed of spinach greens to bowl. 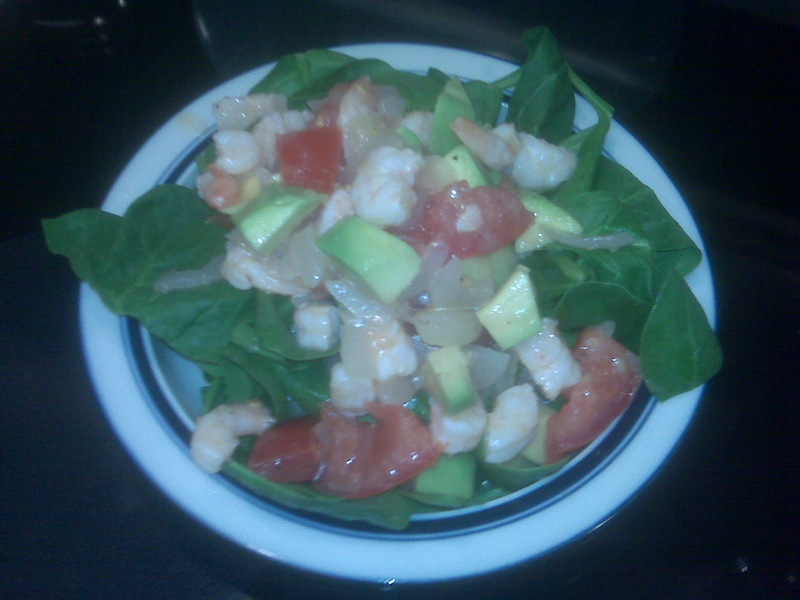 Top with the shrimp avocado mix and add the juice to serve as salad dressing. Enjoy! I then made myself a smoothie and it was really the perfect nearly summer treat. I dumped it all in the blender and let it go to town for a minute. Serves one. I'm going to try this tomorrow because I've been making a panini almost every day this week and I feel guilty. Today I made a steak one and I feel like hiding under the bed. I do hope you enjoyed!!! This sounds absolutely delicious. Thanks for sharing it with us! "There's shrimp gumbo, shrimp and gritts, coconut shrimp, shrimp coctail..." Movie please? I think shrimp is one of my favorite foods, shrimp and lobster, but you can probably guess how often I get to have lobster. You know I'll be trying this recipe. Chocolate chip cookie dough truffles...I'll email the recipe to you. No raw egg in it either. Delish. Ohhhh good, so glad you enjoyed!